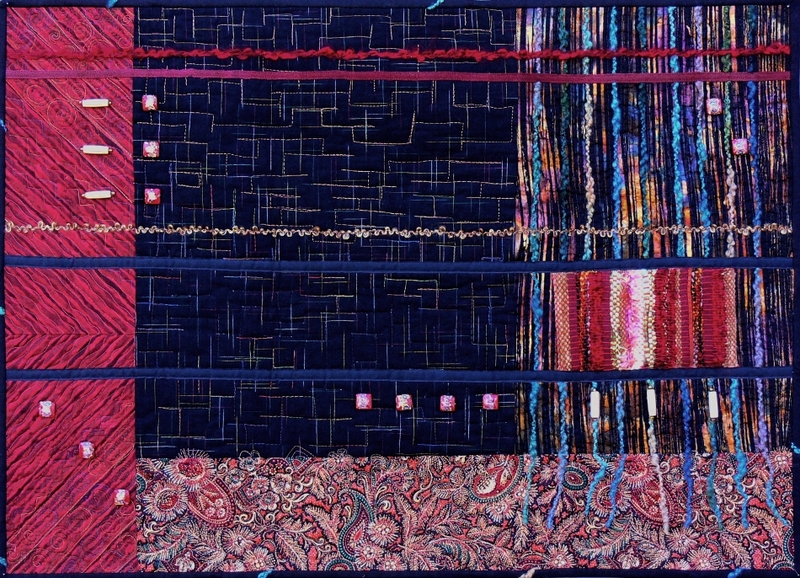 I recently participated in the Sapphire Quilt Show challenge and showed my piece at the show this month. This is the quilt group in my small rural town of Stevensville, Montana. I didn't win any prizes, but I liked the way my piece turned out. 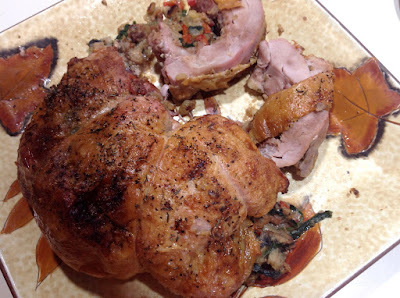 (I did get 2nd place on one of my entries in the main show). We were given two fabrics to work with and could make anything (maximum 100" perimeter), it didn't have to be a quilt, although mine was.. There were two viewer's choice prizes given and one went to a stuffed horse "of many colors" and the other to a cat wall hanging. Cute won over whatever you would call my piece (although I can appreciate cute, I don't usually do cute). I chose to disguise the challenge fabrics rather than showcase them. The multi-color fabric is covered with sewing tools and notions. I cut out some of the buttons and used them to embellish my quilt. The flat piping inside the binding is made from the green swirly challenge fabric. The color is not as accurate in this image, but you can see some of my stitching. 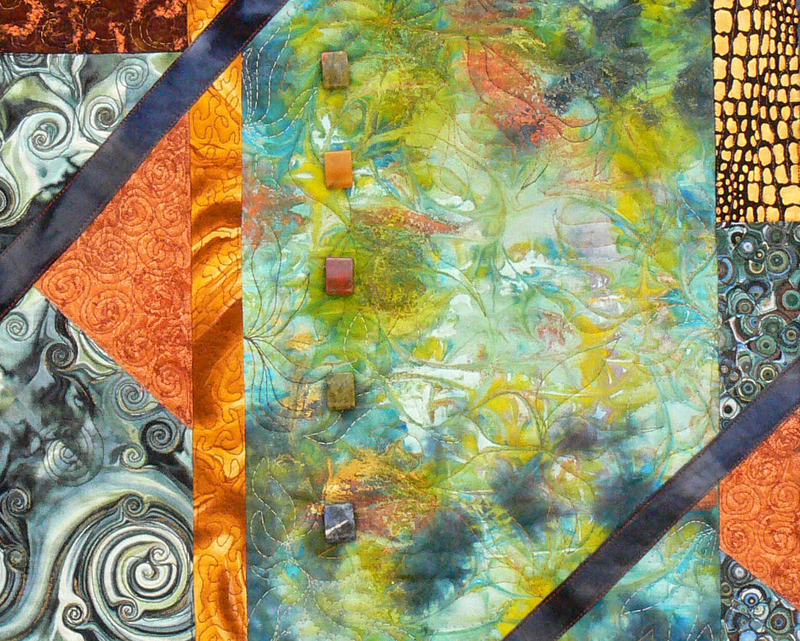 I have been creating art quilts for about 5 or 6 years now and was just recently looking back on some of the images I have of my early pieces. I thought I would share some of them here. I can see a definite improvement in my quilting skills and I think my design skills are better now. I also think that my pieces have become a bit more professional looking and are just technically done better. You might not be able to see this from the images, but when I look at the images I see the quilt in my mind and know all the intricate details of it. And of course as the maker we notice all the flaws, right?!! This first one is called "Blue Marble and Stone" because of the marbled fabric (which I shibori dyed and then marbled) in the center and the stone beads, of which I had five in just the right colors for the quilt---serendipity strikes again! The fabric marbling was done with the shaving cream method. My son did some fabrics too---great project for kids. I think will have to get that stuff out again and play some more one of these days...! Next is "Joy In The Morning" because that it is how it makes me feel when I look at it. This is still one of my favorite pieces, but I have not gotten such a positive response from others. I don't know if it is the wonkiness of it, the fact that the trees are not very realistic, or just the composition for some reason isn't appealing to others. It is meant to be a type of dreamscape or just a visionary landscape, not reality. I don't do reality, but I love trees, landscapes, sunrises/sunsets, and nature. I like this piece and will likely never lower the price, donate this, or give it away. I'll keep if for myself if it does not ever sell. Many of the leaves on the trees are dimensional. I stitched and turned fussy cut sections of the leaf fabric, embroidered them and then hand stitched them onto the background. 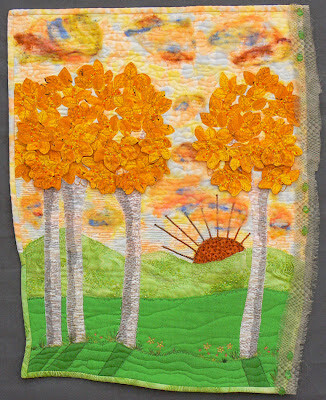 There are embroidered flowers in the landscape, hand needle-felted roving in the sky, and beading on the sun. The right hand side has a piece of filmy silk reinforced with Misty-Fuse so it doesn't ravel. 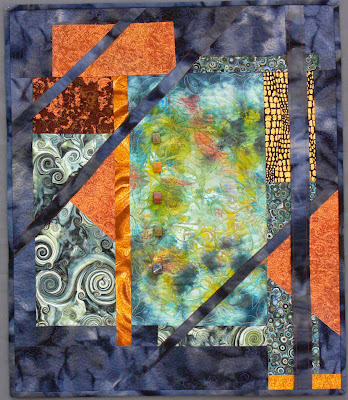 This next one is one of my first art quilts called "Winter Blues". 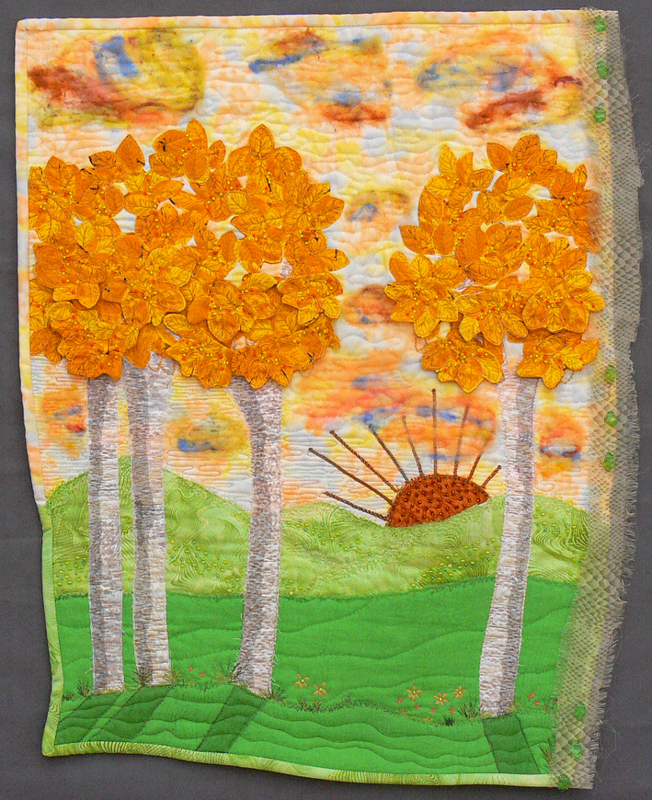 It was my first quilt to be accepted to a national show (Denver Quilt Festival) and it was purchased when it was in my first gallery exhibition. I know the owner and have seen it recently. I still like the piece, but it was not my best workmanship. The owner loves it, and that makes it a success for me! 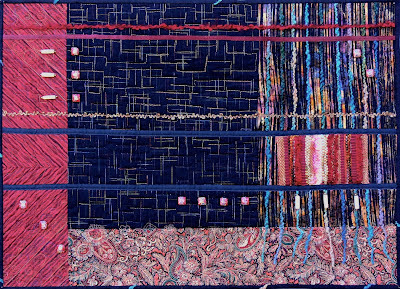 I used hand-woven Thai silk, Angelina fibers, couched yarns, and beading to give this piece interest. This next piece is called "In A Heartbeat". It was auctioned off for the Missoula Art Museum's juried silent auction two years ago. Couching yarns and using stone beads are two ways I still use frequently to create texture in my pieces. It isn't like I have decades of works to look back on (like my mother! ), but I do see progress and improvement in my work over this short span of time. Thanks for looking back with me! This piece was made recently and it uses a hand-painted fabric (in the center), a woven remnant from a friend who makes clothing, imitation textured suede, and a batik that amazingly is really similar to my painted fabric and a rich solid (at the bottom). This simple composition has an extensive amount of free-motion quilting to create further interest. I really like how the quilting in the light section came out. The circles of "suede" are very interesting and they catch the light in a unique way. Each of the fabrics seems to reflect or absorb light differently so when this piece is hanging it changes as the day goes by and as you move around it. A very interesting, and I think successful, piece. I hope you like it too!